Eric Reiss shares web writing tips that he has gathered over the years. It sems that George Orwell’s rules are a must-have in any such list. "Need to write a research paper for a summer course? Then you’ll want to pay a visit to the Florida Community College at Jacksonville and sign up for English Composition II. The 24-unit video course provides a comprehensive resource for writing academic essays. And you can also learn about technical writing, writing for business, and literary analysis, as well." A resource for writing research papers (direct launch on iTunes). Jina Bolton writes about keeping the interface relevant and useful even after the launch. Her key -- interface style guides. "Interface design standards enable brand stewardship. Commonly documented in a design “style guide,” these standards inform clients and content editors of branding guidelines for typography, whitespace, color, etc. The design style guide provides a reference in which developers can describe the way the interface is intended to look, and helps designers to be consistent as the interface is updated so that, in turn, the interface continues to feel consistent." When building websites, information architecture is not the only structure there is. There is also the visual structure and then the most important of them all: the structure of the copy or the written text. A good IA may support a bad visual structure but it surely can't support a bad copy. Good copywriting takes time. It is a design process. And like all design processes it requires one to do the research and build a strategy. This is why a copywriter should be involved right from the start, and not as an last-minute add-on when everything is complete. I still believe the it is much better to teach subject matter experts good copywriting skills than hire an external copywriter for short durations to fix broken content. Ideally, you should work with a writer from day one to design the voice of the copy in conjunction with the visual language of the site. And getting a writer involved early can help you solve lots of other problems—from content strategy issues to information architecture snags. Remember that writers are creatives too, and they are, in many cases, the keepers of the content your design ultimately serves. Nice tutorial on writing good accessibility statements. Did not think of them like that before. Well worth a read. Accessibility statements are an ideal place to empower visitors to your website. Most accessibility statements are too technical, and don't necessarily address the needs of the visitor. Those that do address the needs of visitors often have the information lost in a myriad of other information that is unlikely to be understood by the average visitor to the website. What should and shouldn't be included in an accessibility statement? Tip three: "Make sure that the most important keywords get used in the heading and summary. Always lead with your best keywords. You are not writing a murder mystery. Tell them who did it in the heading." 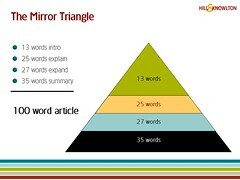 Good articles on the writing web content. "In order to make things happen, people must read your document and thendo something with your information. For instance, they might use your document in making decisions, forming opinions, or influencing the opinions and decisions of others. They may follow your instructions to complete a task or assess a situation or option. They may alter their priorities. They may recognize new opportunities, problems, or risks. And so on. The "...and then do something" part is where your document's conclusion comes in. Your conclusion should move readers from information to action." I use this site regularly to review and check my own writing. It is very useful resource to have at hand. "What's the single most important thing that could improve the Web? It's not broadband. It's better writing. The general quality of writing on the Web is poor. The way you write has a major impact on what people think of you. Avoid these common mistakes and you will achieve more with your website." "Metadata gives your content context. Content that does not have effective metadata is not web content. It is sloppy, next-to-useless print content that has been unprofessionally published on the Web. If you don't have time to publish professional metadata for your content, you shouldn't be allowed to publish anything on a website." Comment: CNA uses the same Q&A exchange model to share know-how, but what's interesting in this case study is the way CNA used storytelling to spread the word around and get employee buy-in. A classic Steve Denning case. You're doing your online thing, writing copy you think is captisuasive, but I'm seeing a heck of a lot of stuff that reads like this: "The blankety-blank is the true essence of a high-performance blankety-blank, delivering sizzling blankety-blank in an absolutely refined way. It's a paradigm shift with profound implications for blankety-blank." Trouble is, your online visitors are 'speaking' very differently. Try this eye-opening exercise: Find a product or service that has user newsgroups, message boards or list-serves and compare how that company talks (pay a call on its website) to how its customers talk.